Start, Center, End and Fill define the view’s alignment within its space. Expand defines whether it occupies more space if available. Alignment: How is the view aligned within the parent view? Center: The view is centered. Fill: This alignment is slightly different. The view will stretch across the full size of the parent view. If the parent, however, is not larger then its children, you won’t notice any difference between those alignments. Alignment only matters for parent views with additional space available. Expansion: Will the element occupy more space if available? Suffix Expand: If the parent view is larger than the combined size of all its children, i.e. additional space is available, then the space is proportioned amongst child views with that suffix. Those children will “occupy” their space, but do not necessarily “fill” it. We’ll have a look on this behavior in the example below. No suffix: The children without Expand suffix won’t get additional space, even if more space is available. Again, if the parent view is not larger than its children, the expansion suffix does not make any difference as well. 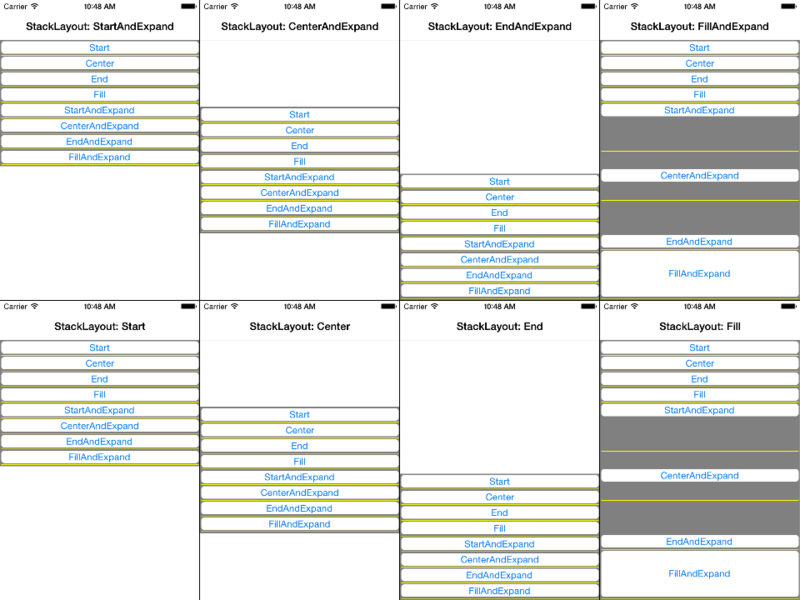 Let’s have a look on the following example to see the difference between all eight layout options. The app contains a dark gray StackLayout with eight nested white buttons, each of which is labeled with its vertical layout option. When clicking on one of the buttons, it assignes its vertical layout option to the stack layout. This way we can easily test the interaction of views with parents, both with different layout option. As long as the parent stackLayout is tight (does not Fill the page), the vertical layout option of each Button is negligible. The vertical layout option only matters if the stackLayout is larger (e.g. via Fill alignment) and the individual buttons have the Expand suffix. Additional space is evently proportioned amongst all buttons with Expand suffix. To see this more clearly we added yellow horizontal lines between every two neighboring buttons. Buttons with more space than their requested height do not necessarily “fill” it. In this case the actual behavior is controlled by their alignment. E.g. they are either aligned on top, center or button of their space or fill it completely. All buttons span across the whole width of the layout, since we only modify the VerticalOptions. Here you find the corresponding high-resolution screenshots.